Well, I've finally finished my flag book, I can't believe that it's taken me so long! June was such a busy month, and the time just flew by. 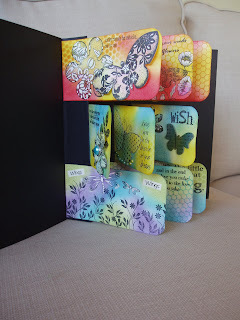 I have chosen to incorporate some elements used by Willy in her lovely book shown in Craft Stamper magazine, like the bleaching, for example. However, I decided to make my flag book more three dimensional. 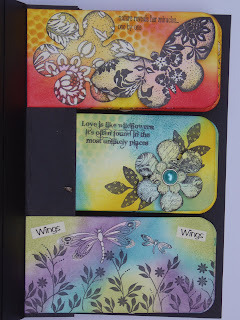 Although I have chosen different stamps, and a different colour scheme to Jo and Lesley, I wanted to add more elements. Therefore, I have introduced decoupage, layering, and chipboard shapes to some of my tags. 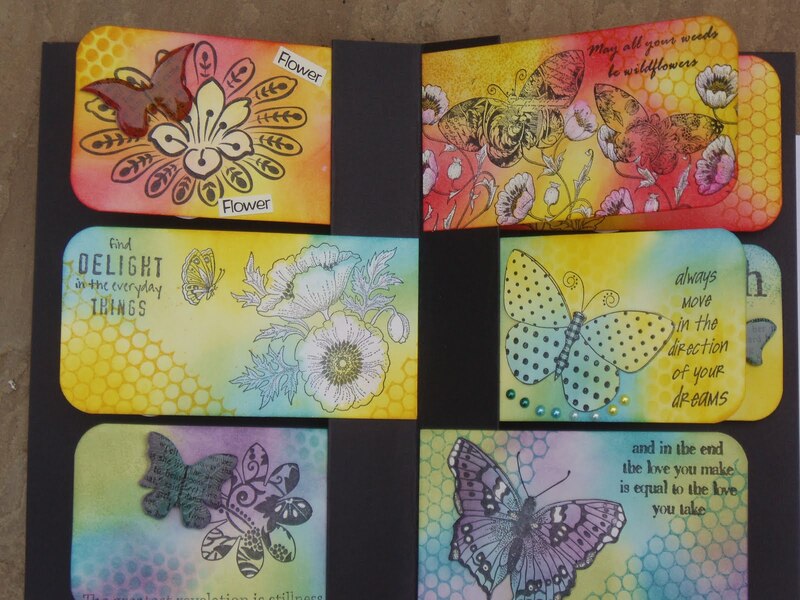 I have used butterflies and flowers throughout the book, which could have become repetitive, so I needed to vary what I did to my tags. 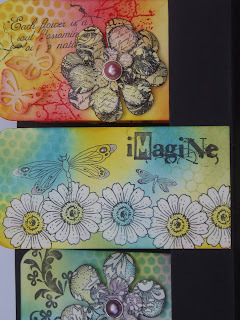 Those of you who saw the sneaky peeks on my blog last night could be forgiven for thinking that I have gone with red, yellow and orange as my colour palette, but I decided to use a few more than that. I have also used green, blue and purple too! I have graduated my colours, rainbow fashion down my book, to again add variation to the whole thing. 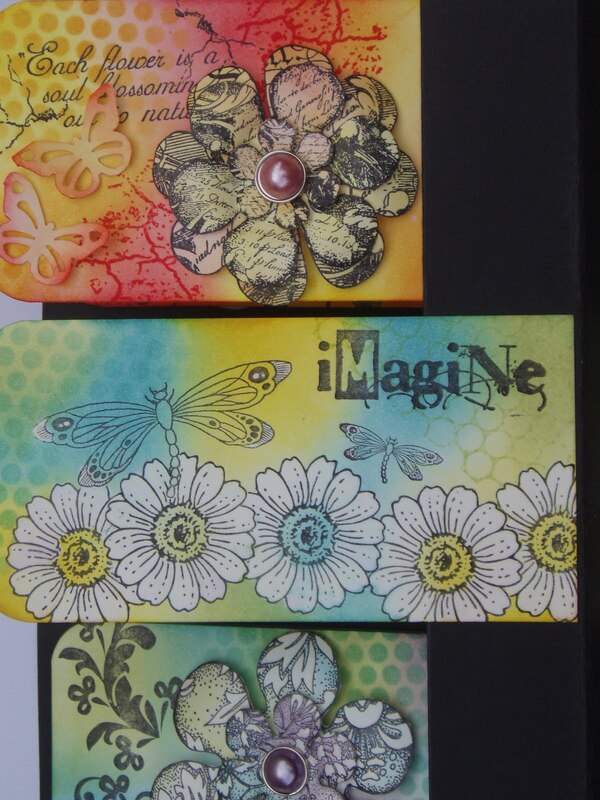 I used the gorgeous Patchwork butterfly from Elusive Images on the front cover with a layered flower, also from Elusive Images. I have given the butterfly some antennae which Jo might recognise as a present she gave me at our mini Retreat. I have used cream Prima leaves, brushed with DIs. For the back cover, I have again used my Elusive images stamps, and made a poppy head from a cream flower, by folding it up, and again colouring it with DIs, and glueing it in place. 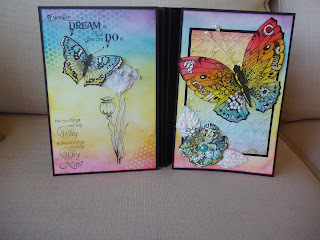 Throughout the book, I have used sequin waste, or a sequin waste effect stamp as a background. 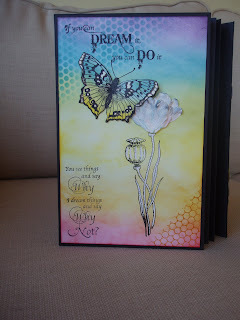 I chose to use black card like Willy, Jo and Lesley, as it really is the best colour to display the lovely colours that I have used, and brings the Stazon out. I really enjoyed bleaching some of the images, but even in a well-ventilated room, it gave me a headache. Here you can see the inside of my flag book, and the graduation of the colours that I used. The first layer at the top was Mustard seed, Wild Honey, and Barn Door. The second layer are Mustard Seed, Shabby Shutters, and Broken China. The third layer are Shabby Shutters, Broken China, and Dusty Concord. I kept a common element from one layer into the next, and so on. I have lots of photos to show you, and apologise if you feel overloaded by them, but would like to show you one or two tags close up. This is a stunning piece of work Judith and the images you have used are lots of my favourites too. The graduation of colours does indeed look like a beautiful rainbow. I love all the quotes you have used and the added dimension to some of your images. I agree it has been a lovely project to do and I think the pieces we have produced so far show how much we've enjoyed doing them. 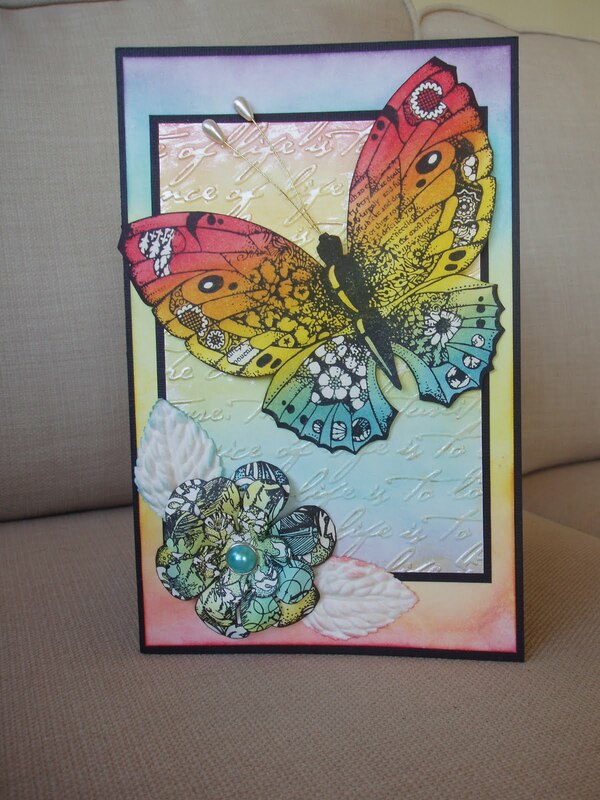 Wow Judith, what a stunning project you have done - I love the rainbow effect, it works so well. As you say the colours are so uplifting amd I am sure you will get a lot of pleasure going back to look at this book again and again. You know I love my butterflies. It was worth struggling with the bleach, the highlights do add an extra something. Only me to go now, I really do have to get my finger out now!! 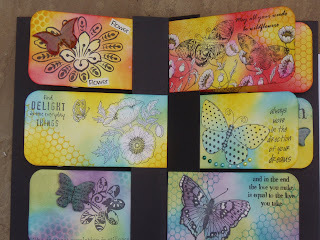 Beautiful work and some lovely images used. A labour of love! *lifts jaw off floor* totally stunning!! Gorgeous Stunning and beautiful and all of the above! Wow! This is definitely my favorite project you ladies have done so far. 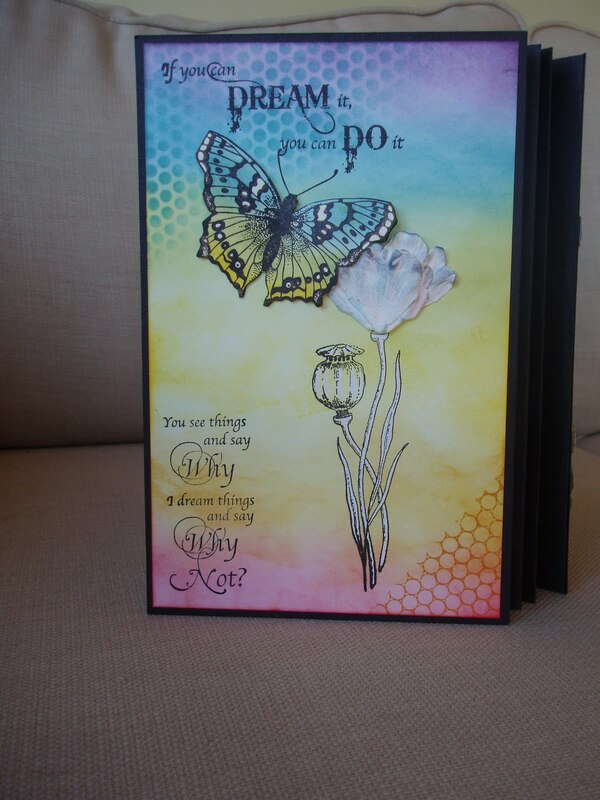 Becaues of the inky backgrounds and the lovely colors! Breathtakingly beautiful. 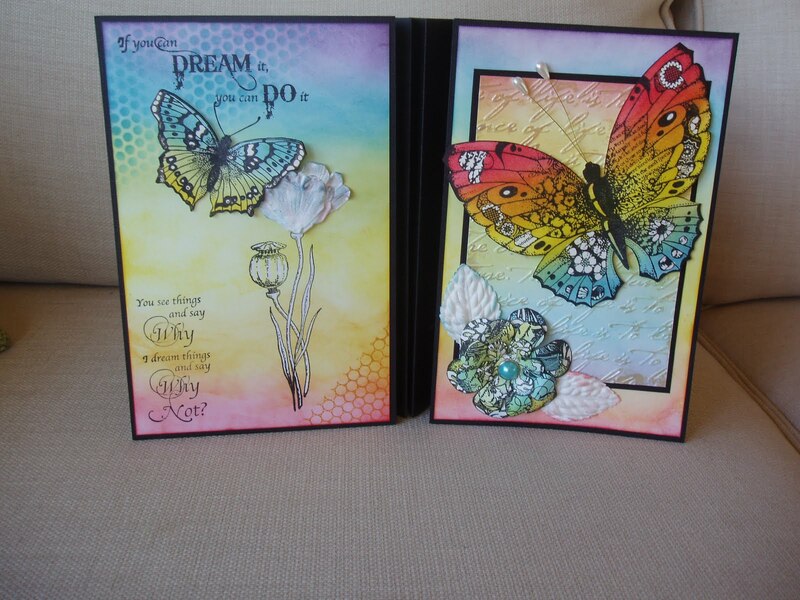 I love the rainbow effect with the colours and the floral and butterly theme throughout, along with the dimension you have added. Wow this is beautiful and the way you have worked the colours is so good. I can tell you enjoyed this project and it was interesting to see you went for a more 3D effect than the original. I intended having a go at this when I saw it but have yet to make a start (story of my life). 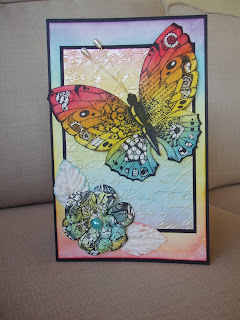 this is really gorgeous Judith - loved the rainbow theme too. 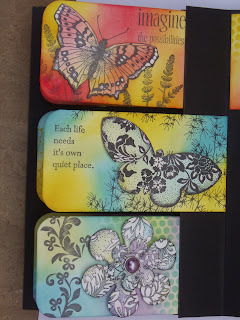 Having seen the 3 books so far, I have actually got as far as cutting out tag shapes and inking some of them in greeny shades - hopefully they will end up finished with my favourite wild meadow stamps, but no guarantees! Gorgeous colours Judith and I love the graduation throught the whole book. Beautiful colours and lovely words - I have those Elusive Images words and love them, too! It's a fab project and a real inspiration. Judith, your book is divine. What you have done with your rainbow colours is really inspired and I am so taken with your cover. You have used that Inka Gold to great effect. I want to have a go at making rainbows now!